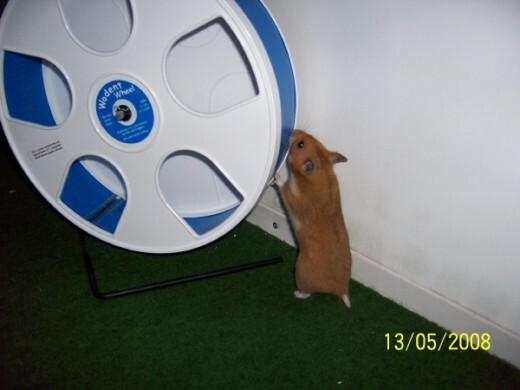 Exercise wheels are important accessories to your hamster's cage as they are the main method for hamsters to relieve their pent-up energy and stay fit. 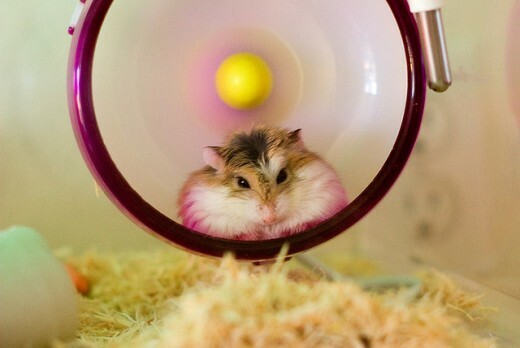 There are many exercise wheels for hamster, but not all of them are ideal. You must make sure they have a solid bottom since mesh and wire wheels can cause serious injury or even death if the hamster becomes caught in it. 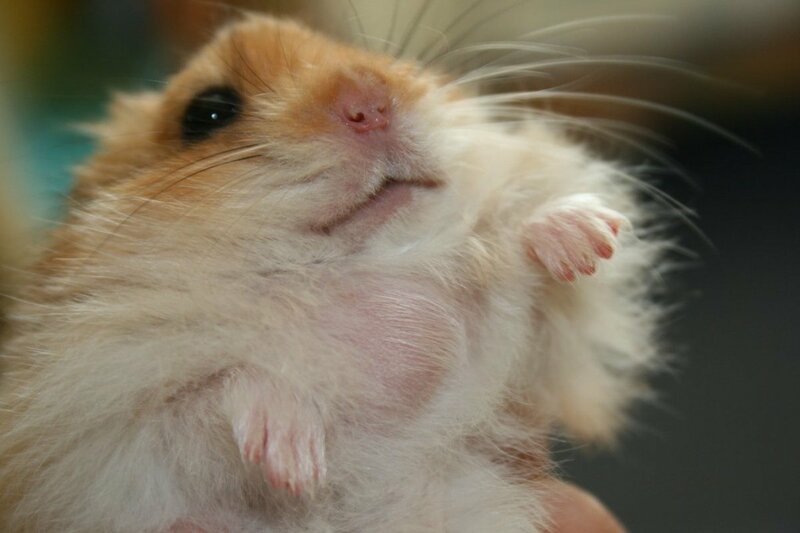 In addition, because syrian hamsters grow larger than dwarf hamsters, you must have a large enough wheel so he or she doesn't damage her spinal cord from being cramped in a tiny hamster wheel. 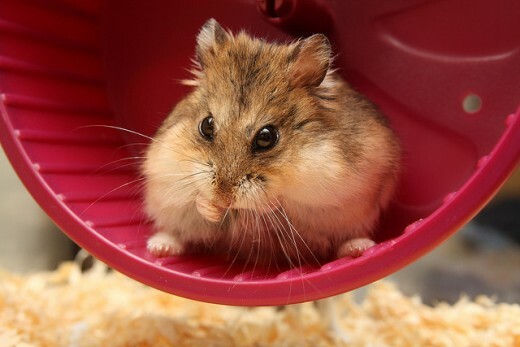 Some people keep their hamsters in plastic bin cages or tanks where a hamster wheel can't attach to the walls, so they may need a free-standing wheel. However, in wire cages, you might want a wheel that connects to the wall for it will take up less room. One last consideration is the noise level of the wheel, particularly if the hamster is kept in a bedroom. Some hamster wheels make very loud, unpleasant screeching that will keep you up at night. Read on to find reviews on common brands of hamster wheels. 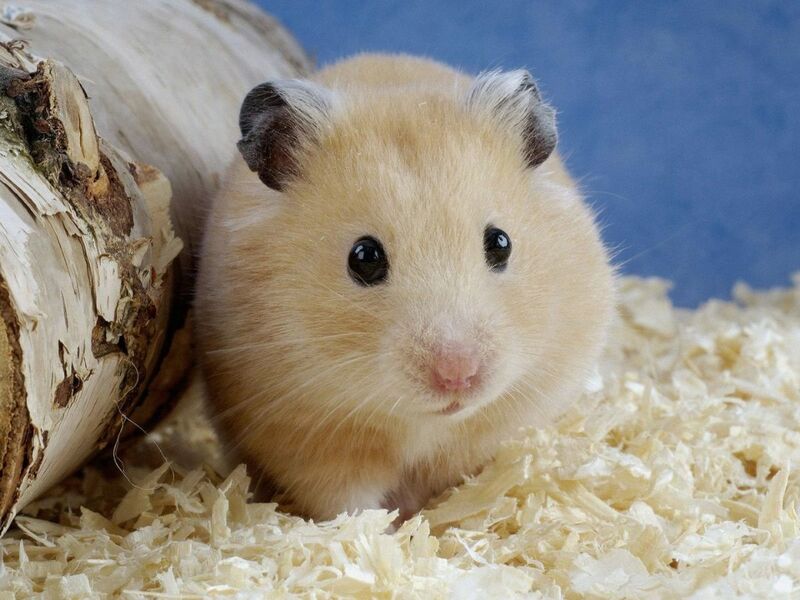 Silent Spinners are perfect choices for dwarf hamsters, but may not fit your syrian. Wodent wheels are excellent choices for your syrian hamster! Like the silent spinners, the Wodent Wheels also are known for their low noise level. They come in three sizes- 8 inches (good for the smaller-sized syrian), 11 inches (better for syrian hamsters), and 12 inches (probably a little on the large side) Wodent Wheels also have a wall in the front of the wheel with holes as added security for the rodent, so he or she cannot flip out of the wheel. As an added bonus, they are made from recycled materials, and are ASPCA approved! Kaytee Silent Spinner Wheel, Giant 12"
This wheel is perfect for larger critters like chinchillas, rats, and large syrian hamster! The silent spinners are one of, if not the, most popular hamster wheels on the market today- and for good reason. They are, as their name implies, virtually silent. Unfortunately, these wheels only come in three sizes- in 4.5", 6.5", and 12" diameters. At least 8" is recommended for a syrian hamster's wheel size, but this is probably too small for most. However, for a baby or young teddy bear hamster, the 6.5 and 8 inch wheels should do until they grow larger. 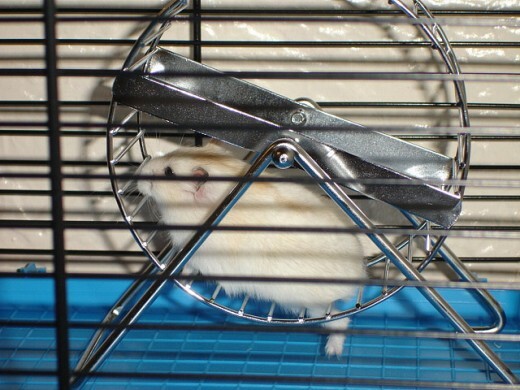 Most syrian hamsters should use the 12" wheel if they can manage to push it along. The Comfort Wheel is a good brand, but if you want to keep your hammie in your bedroom and still sleep at night, this isn't recommended. Vegetable oil can be used at the axels to help lower squeaking. The Comfort Wheel can be rather wobbly and rattle the cage. However, this wheel is safe and has a stable floor. Unfortunately, it only comes in two sizes for syrian hamsters- 8.5" for smaller hamsters, and a 12" if he or she is very large. Comfort wheels are healthy and fun choices for your hamster. The flying saucer is probably the most unique wheel in this article. Rather than being a regular wheel that spins in a circle, it has a flatter design that allows the wheel to spin horizontally. The company claims that it "could easily be the safest wheel in the world." This is because it has a solid surface with "sure-footed treads." It also claims to be completely tail safe. But many owners claim that it's unsafe because their animals fly off the wheel if they try to stop. These wheels are very quiet, and some animals may prefer these to regular wheels. Because of their design, the wheel cannot be attached to a wire cage and take up quite a bit of space. 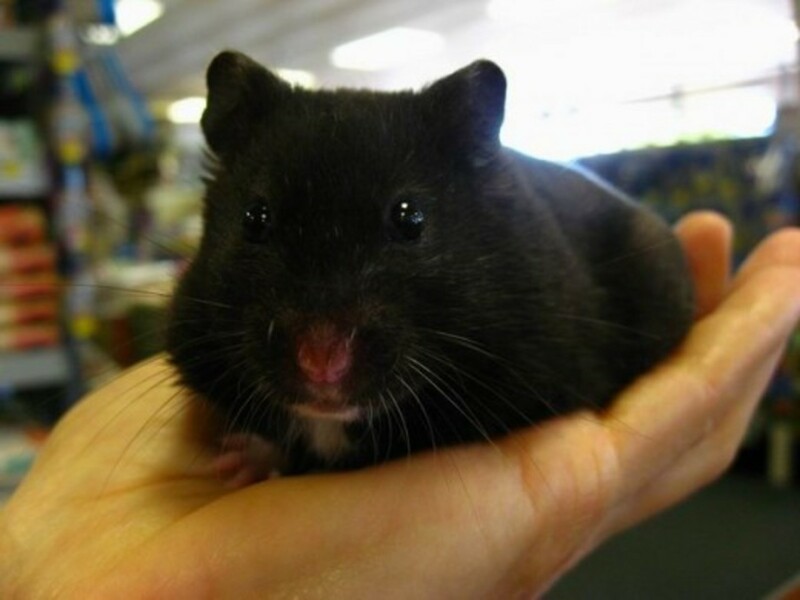 The only sizes available for syrian hamsters are the medium, which has a 6.5" diameter (for very young and small hamsters), and the large- with a 12" diameter, there may not be much room in your tank for anything else! This is a short hub describing the different species of hamsters that are kept in captivity today. A brief article describing how fish bowls are unhealthy, and why you should use aquariums instead. This wheel is NOT recommended by many pet-owners as the wire floor can be very dangerous. 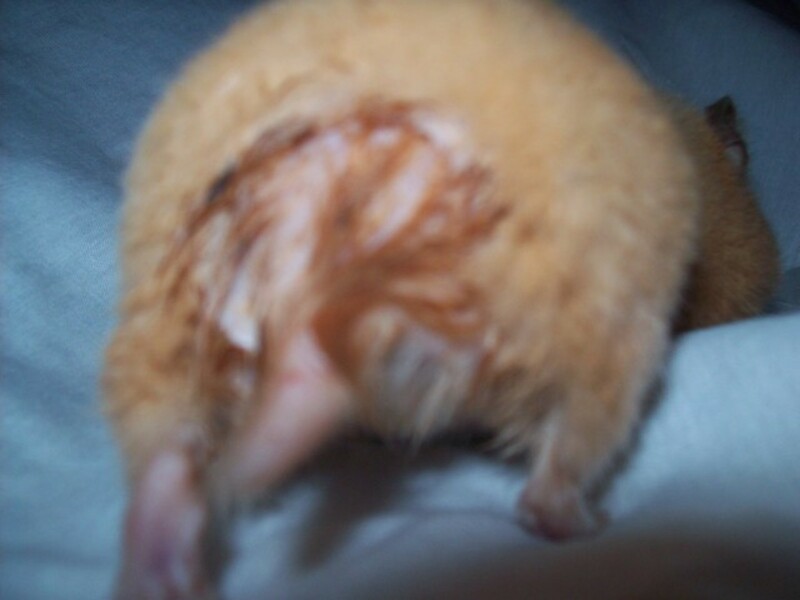 It is very easy for a syrian hamster to lose toes if they get caught between the metal grids. If you are thinking of buying this wheel, please reconsider, or if you have one already, think about trying another type of wheel. Never buy a hamster wheel that is designed like this one. Even more dangerous than the Run-Around wheels are exercise wheels with metal rungs. This has caused a great deal of death and injury among small animals and should NEVER be kept in the cage. I would like to know if tank size plays a role in a hamsters longevity? My daughter has a teddy bear hamster and I know nothing about these animals .but I feel a 10 gallon tank is a little small. I use a Wire Wheel with really little wire squares but I am going to buy a solid one now that I have read this. Thank You! I love Toby so much so I would be really sad and depressed if he died. Thank You Soo Much! !